Plan and coordinate travel plans with ease. Planning your team's travel itinerary can become overwhelming, if you don't have the right tool. 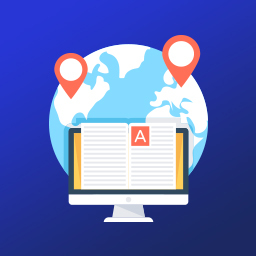 Whether you're booking flights, managing passport info, or accounting for daily expenses, this application has everything you need to streamline employee travel. Get a comprehensive view of key stats with the travel dashboard. Display travel and visa requests, classified by their approval status, along with graphs of monthly expenses and visits (domestic and international). Efficiently handle your employees' travel requests. Record details like departure and arrival dates, purpose of travel, and accommodations. View requests classified by their approval status, with detailed reports. Manage visa and passport details. 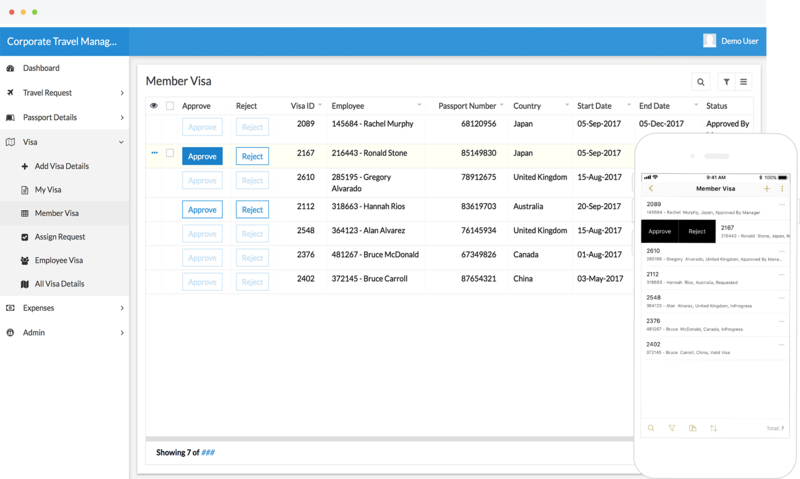 Create visa and passport records for your employees. You can either link visas to a specific record, or store them as separate records. Allow employees to update their profiles and look up the status of their travel request. Estimate, plan, and track all travel costs. Invite employees to submit online expense reports, so the finance team can decide whether to approve the charge, and, if so, reimburse them on time. All an individual has to do is enter the expense type and amount, then upload the associated receipts. 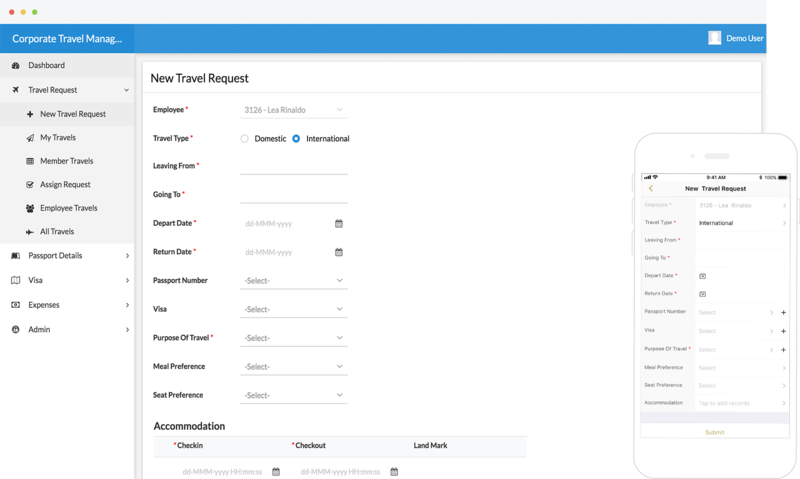 This travel management application is powered by Deluge—a low-code scripting language that uses logic to automate workflows. Need to include a new feature, or alter an existing one? Just drag and drop fields from our intuitive builder, and add a few lines of code. Stay connected to your business, no matter where you are. With Zoho Creator, the apps you build or install are automatically available on iOS and Android devices. 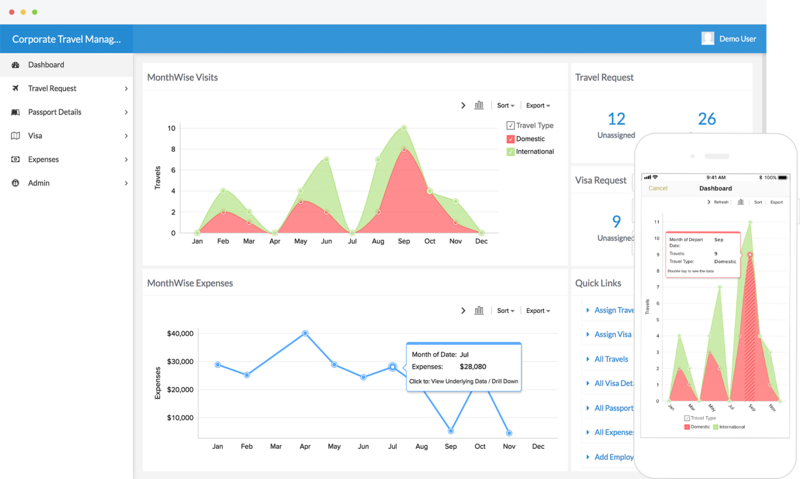 Accept or reject travel requests, view stats, and manage expenses on the go.